Government House, also known as The House of Seven Gables, is the official residence of the Administrator of the Northern Territory. The Administrator is appointed by the Governor-General and performs statutory, ceremonial and community duties. Government House was first completed on its site overlooking Darwin Harbour in 1871, and has endured cyclones, earthquakes, enemy bomb raids and frequent infestations of white ants. 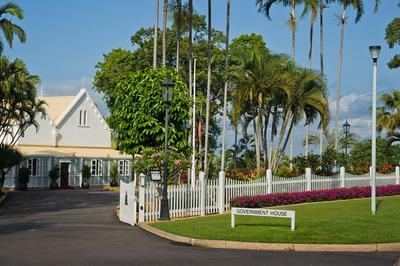 With the stunning 1.3 hectare tropical gardens as a fitting backdrop, the gracious rooms and tiled terrace of Government House are used by the Administrator to host official functions. Government House is declared a protected heritage place under the Heritage Act. Originally known as the Residency, it included a central hall with walls made from locally quarried porcellanite stone and attached sleeping apartments and verandahs made of wood. The roof was thatch and the floors cypress pine. The central stone hall, which is now the Drawing Room, is the oldest known surviving European style structure in Darwin and the only surviving portion of the original building. The Residency was redesigned by John George Knight in 1878. John Knight was a prominent architect and became the 6th Government Resident. Dr John Gilruth was appointed as the Territory’s first Administrator in 1912. He officially changed the name of the Residency to Government House. Substantial changes were made which included new bathrooms, modernised kitchen, servants’ block, rebuilt tennis court and cement rendering to the exposed stonework. The house and gardens were substantially refurbished in the late 1930s by Mrs Hilda Abbott, wife of the 4th Administrator. Aesthetically and physically, Government House today continues to look very much as it did a hundred years ago. It is held in very special regard by Territorians as more than simply a gracious house. It is an enduring symbol of stability and longevity in a young society that has been confronted by the horrors of both human conflict and the ravages of nature.